City of Presidents American Pale Ale is scheduled to arrive at Quincy Center bars and restaurants on Friday, August 17, the first and only craft beer brewed exclusively for distribution in Historic Quincy. The deliciously flavorful, complex but easy-drinking pale ale was crafted by Widowmaker Brewingof Wood Road in Braintree, steps from the Quincy line. The beer is being released at a time when Quincy Center is enjoying a construction boom and is about to welcome a second wave of new eateries on the heels of last year’s arrival of 10 new dining destinations. Pending newcomers include Idle Hour, a cocktail-centric neighborhood bar featuring dishes from celebrated former Drink chef de cuisine Ashley Gaboriault; Rewild Plant Food + Drink, touted as America’s first plant-based beer hall and café; and Belfry, a new urban beer hall from the team behind critically acclaimed Quincy Center cocktail boite The Townshend. The City of Quincy is also about to celebrate the opening of its world-class new downtown green space, the Hancock-Adams Common, in a Sept. 8 ceremony featuring local dignitaries, Mayor Tom Koch, Governor Charlie Baker and Pulitzer Prize-winning historian and John Adams biographer David McCullough. This public park, boasting green space, fountains and monumental statuary of Quincy natives and Founding Fathers John Hancock and John Adams, promises to be the centerpiece of the new and improved Quincy Center. In the spirit of Quincy’s historic past and bright future, City of Presidents American Pale Ale is a brewed with 100 percent all-American ingredients, including domestic malts and a blend of classic and nouveau American hops: Amarillo, Cascade and Citra. It’s a cloudy hop-forward pale ale in the popular “New England style” of craft beer, but one that features a brilliant lemonade-yellow hue from the use of lightly toasted American malts. The sunny color symbolizes the dawn of a new day for Quincy Center. The beer’s soft texture and mouthfeel come from its use of American flaked oats. City of Presidents American Pale Ale tastes great on its own or paired with favorite summertime dishes. The beer is available in 16-ounce cans with a label that features the facade of Quincy landmark Church of the Presidents, plus modernized images of Quincy’s favorite sons chilling out with sunglasses drinking this cool new brew: President John Adams, President John Quincy Adams and President of the Second Continental Congress John Hancock. The label was designed by Quincy artist Jacob Callaway of Verified Beer Traders. 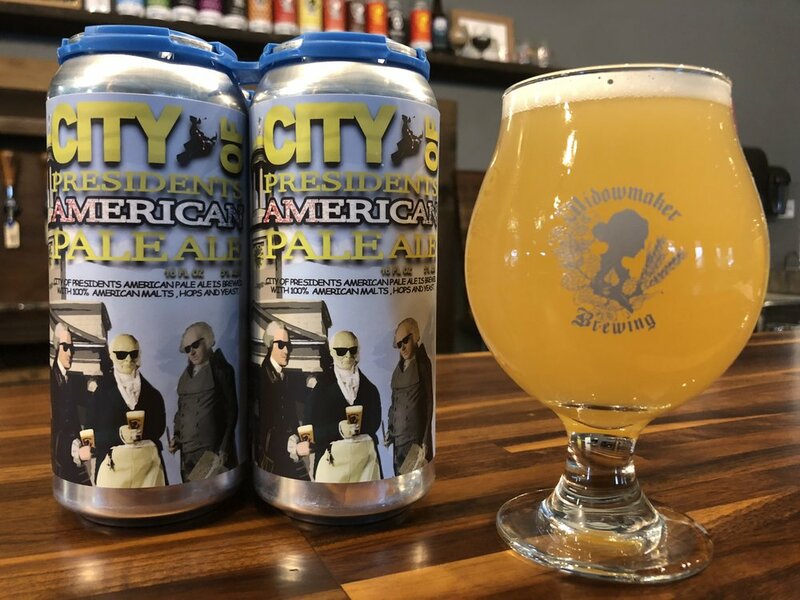 The first run of City of Presidents American Pale Ale will be available exclusively at Quincy Center bars and restaurants, including 16C, Alba, Angelo’s Coal Fired Pizza, Cagney’s, Fat Cat, The Fours, Fowler House, Fuji at WOC, Idle Hour, Malachy’s, Paddy Barry’s, The Pour Yard, Rozafa, S6, Shaking Crab, The Townshend and Zef Cicchetti & Raw Bar.